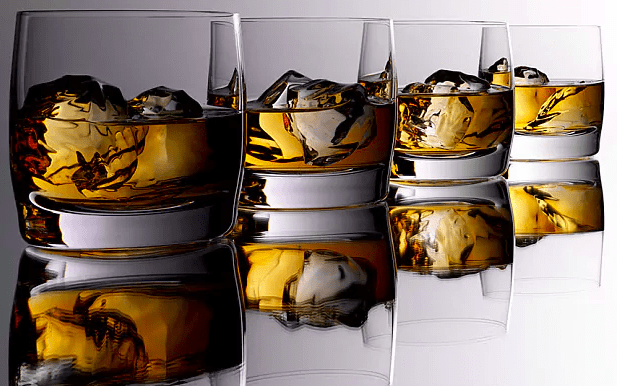 Scotch Whisky = Liquid Gold? 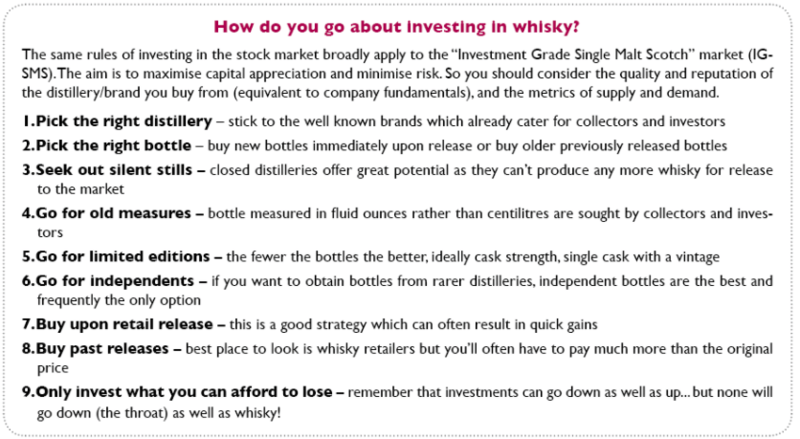 First of all, I should point out that although I have worked in the drinks industry for a while, in particular within Scotch whisky, I am more of a Drinker than an Investor or Collector. 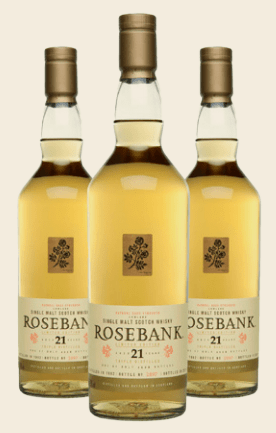 Therefore I have tried to look around for advice on this topic and keep coming back to the people behind Rare Whisky 101, Andy Simpson and David Robertson. The number of bottles of Single Malt Scotch whisky sold at auction in the UK increased by 47.25% to 39,061 (H1 2016 26,527). The £ value of collectable bottles of Single Malt Scotch whisky sold at auction in the UK rose by an exceptional 93.66% to an all-time half-year high of £11.176m (2016 £5.771m). The average per-bottle price has risen to a new record of £286.13, up from H1 2016’s £217.56 and FY 2016’s £241.87. 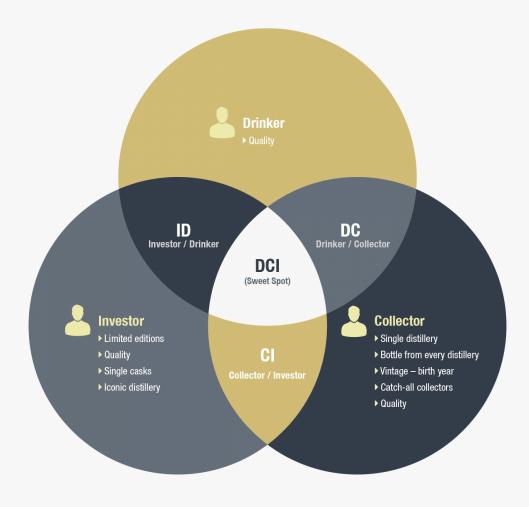 They have a very clear demarcation of the three types – Drinker/ Collector/ Investor – mentioned in their ‘DCI Model‘ (pictured below and click on link for more information) and their subsequent motivations and key factors. I guess your first task should be to determine where you sit in relation to the model and what is important to you when it comes to this Liquid Gold. 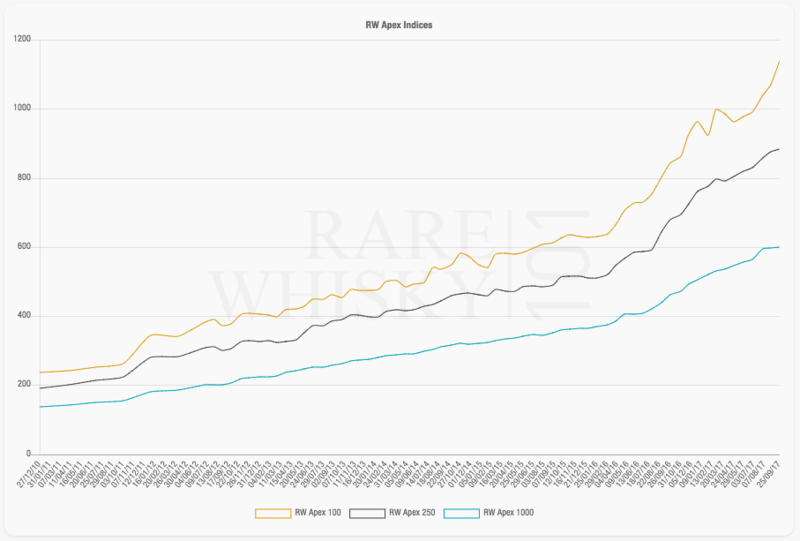 Rare Whisky 101 also has an extensive database which contains factual, accurate open market values for the sale of 259,625 bottles of Single Malt Scotch covering 31,969 different bottlings by September 2017 – impressive! This means that they can provide different indexes for different assets grouped together, representing a specific sector of a market or a market in its entirety. To review all of their available options – click here. 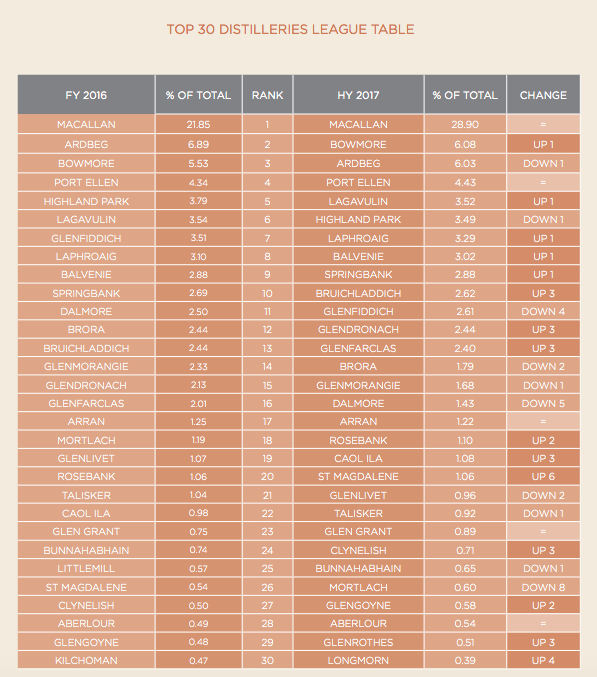 Below is an example at one of their indexes and also the Top 30 Distilleries league table based on value (sold in the open market). 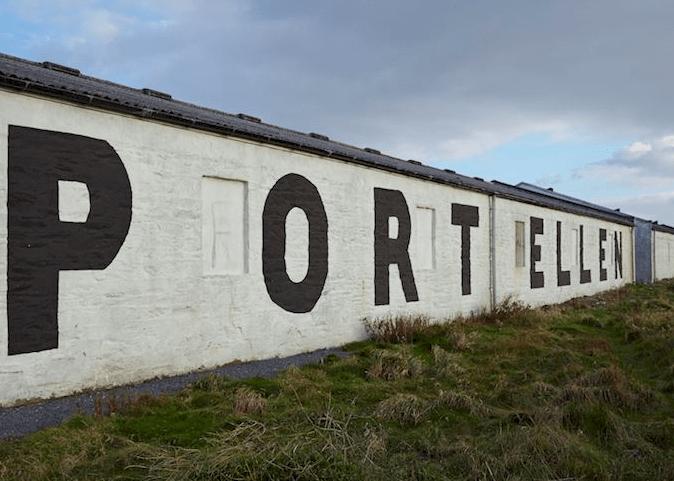 Therefore, based on all of this available information, is it possible that we may experience a devaluation on stocks of Port Ellen, Brora or Rosebank in the secondary market for rare whisky? Personally, I think it is highly unlikely that they will devalue as investors and collectors will continue to look for scarce products with high desirability. These distilleries already feature in the Top 30 Distilleries league table (based on open market figures) and their rare stocks will remain relatively rare given that it will take some time before production re-starts and stocks are aged sufficiently to have any sort of impact. At most I expect that we may see other ‘ghost’ (closed) distilleries over-performing these in the medium to long term given that the scarcity factor will have a role to play eventually. Either way, Scotch Whisky if invested and/or collected in the right way, can certainly be justifiably seen as Liquid Gold…just keep an eye out for those fake and forgeries! See here for more info. That is a great write-up, Andre. For my total despair, I’m a DCI. And of the worst type. I love the vintage expressions from Bowmore, and am trying to collect as many silent stills as I can. However, that’s a pretty though job here in Brazil. I’ll launch a post about collecting whisky soon. Would you mind if I mentioned your blog and this specific post?